Take an active full-day tour on Bali that includes a sunrise trek to the top of Mount Batur and a white water rafting trip on the Telaga Waja River. See Lake Batur and Mount Rinjani after a 2-hour hike to the top of Mount Batur, then splash through class 2-3 rapids during your 3-hour rafting trip. Includes, all transportation, breakfast and lunch, and a stop for tastings at a coffee plantation. Rest in the van after pickup from your accommodation between 1:30am – 2:30am, depending on your location. After arriving about 3:30am at the village of Toya Bungkah, meet your trekking guide for a hike overview and safety briefing, then start trekking at 4am. Expect a steep climb that takes about two hours to reach the summit of Mount Batur, which stands 5,633 feet (1,717 meters) above sea level. 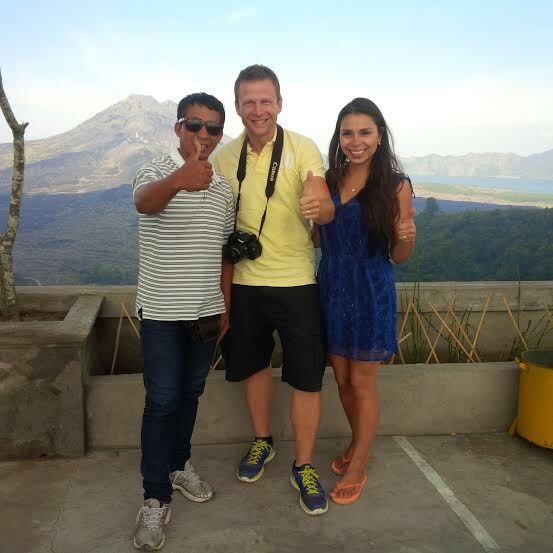 At the top, eat breakfast and watch the sunrise as you take in views of Lake Batur and Mount Rinjani. Have the option to take an additional walk around the crater and lava flows. After the hike back down Mount Batur, relax in the van during the 1-hour drive to the site of your rafting trip, Rendang village. Your rafting guide provides a paddling lesson and safety briefing, then leads you and the other participants out on the water shortly before mid-day. Expect to encounter class 2 and class 3 rapids during your exhilarating 3-hour white water rafting tour. Along the riverbanks you’ll see rice fields, rain forest, towering waterfalls and cliffs with carvings etched into the rock. On the return drive to your hotel, stop at a coffee plantation for samples of Balinese tea and coffee. Your tour also includes a lunch of Indonesian or international fare, and drop-off at your hotel around 6:30pm.